Click "Join" – that's all there is to it! There may be a short wait while your Instant Adventure is prepared, you will be placed into a queue if all Instant Adventure groups for both zones are full. However, this is unlikely as there can be several groups in each zone running at the same time. Like an instance, you queue up and you get teleported to the target zone. It is not an instance of the zone so there are still other things happening around you but you and your raid will have a series of objectives that run you all over the zone. As you finish each you get quest XP (3,540 per quest) and a new quest. The number of mobs you are asked to kill scales up as more players join the raid. Each quest can also take place in several different areas. 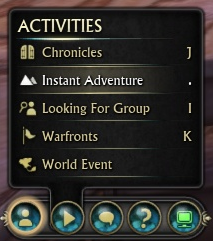 Quests in Instant Adventures run in Arcs of quests that will be located near each other. When you reach the end of a Quest Arc you get a message that your adventure awaits! Click Teleport to jump to the area of the next quest. You must be out of combat. On test there was no "Return" button, so you will need to make your own way back to where you were before you joined the Instant Adventure. The first Instant Adventure available is Stillmoor and Shimmersand. First off, let us say this clear and loud. The Planar Attunement experience for level 50's running Instant Adventures is INSANE. In a little over an hour or two it is easy to ding a level. Between the direct XP and the quest XP, then add to that the Crystallized XP items that drop like candy from a pinata. On top of that you get Inscribed Sourcestone and, rarely, epic gear or mounts such as the Black Tail Vaiyuu Reins. The individual quests within each arc are randomly drawn from a pool, with each new quest coming from the same area or an adjacent one so you are not run all over the zone, and each arc ends with a Boss or Defense. Some arcs have a quest or two that can appear more than once randomly in the same arc. Some of the same quest names appear in more than one arc but with different locations. The quests listed below are an example of what you will find in an Instant Adventure. Our database lists ALL Instant Adventure quests here. Each quest name lists five versions of the quest, each with different quantities needed to complete the objective (depending on the size of the raid). With Rift Patch 1.9 new Instant Adventures will become available in Silverwood, Freemarch, Gloamwood, and Stonefield! Currently on PTS. Unlike Shimmersands and Stillmoor, every IA teleports you to Abundant Wilds but the tasks do not teleport you from area to area. You are expected to use the Travel Stones to move. You have 15 minutes to complete each objective. Available during the Tempest Rising event. Must be in Meridian to start this adventure. Available during the Tempest Rising event. This page last modified 2012-09-08 19:13:31.